Democracy is not a right. Democratic values must be fought for and protected every day, sometimes in seemingly small ways, and even in Canada. 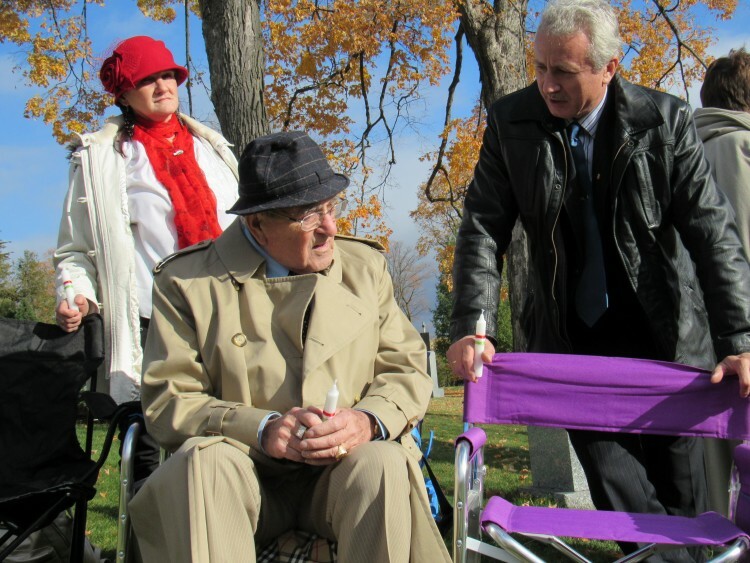 This was the overarching message of this past Sunday’s commemoration of the 1956 Hungarian Revolution in Ottawa’s Beechwood Cemetery, organized by the Ottawa Hungarian Forum. 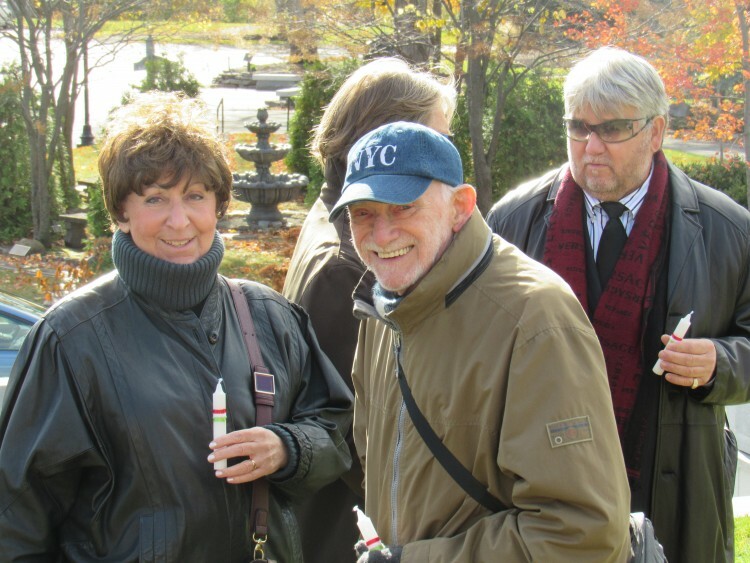 The Forum is a fledgling grassroots community group in the Canadian capital. Judit Petényi, the host of the city’s weekly Hungarian-language broadcast on CHIN Radio, opened the commemoration with poignant words on what 1956 means to her…someone who grew up in Hungary at a time when the revolution was not talked about and also as a Hungarian Canadian who has come to realize that the values of social justice and democracy that were so prevalent in the uprising had to be defended in Canada as well. 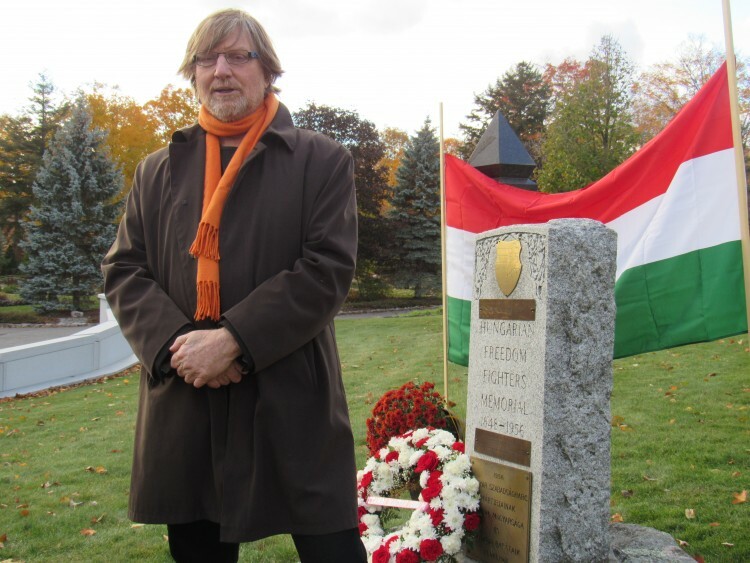 Bálint Mészáros lays the Ottawa Hungarian Forum’s wreath at the foot of the 1956 Hungarian Freedom Fighters’ memorial in Beechwood Cemetery. Photo: C. Adam. 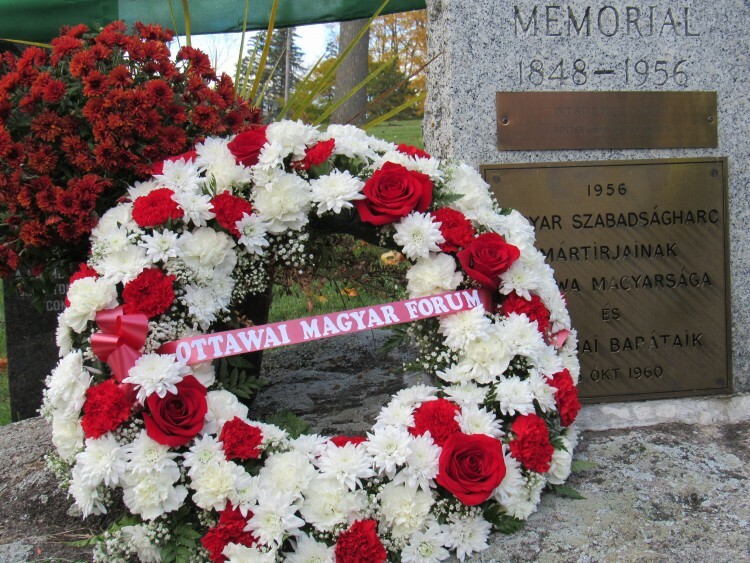 The Ottawa Hungarian Forum’s wreath. Photo: C. Adam. 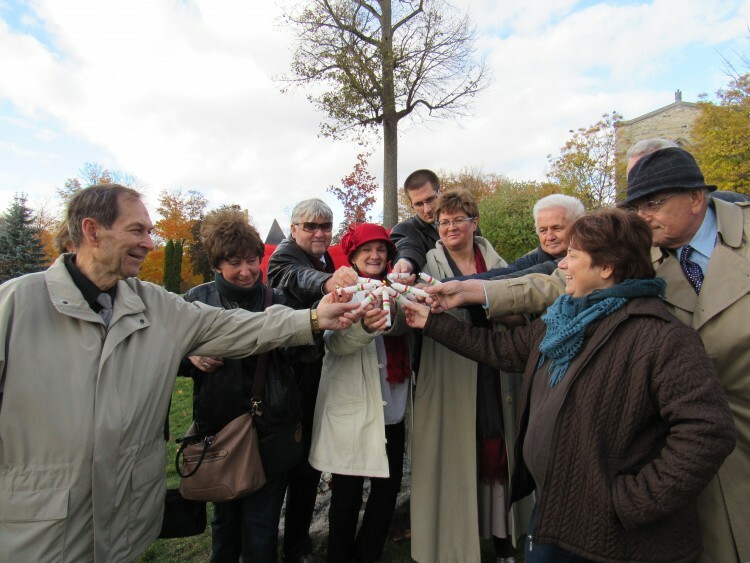 The Ottawa Hungarian Forum was very pleased to welcome three guests from Montreal: award-winning Hungarian author Ákos Kertész and his wife Éva, as well as András Göllner, the founder of the Canadian Hungarian Democratic Charter. Mr. Kertész recited a poem entitled “The Bards of Wales” from nineteenth century poet János Arany, as well as poetry from twentieth century poet Miklós Radnóti. Mr. Kertész highlighted the bravery of Hungarian writers and artists in Hungary during the 1956 Revolution and their commitment to democratic values, suggesting that the same cannot always be said of today’s journalists and writers, when they, their colleagues or the society in which they live, are faced with oppression. Éva and Ákos Kertész. Photo: C. Adam. György Takács, a local Hungarian active in the Ottawa community, was 21 years old when the revolution broke out. He shared some of his recollections of what he saw in central Budapest, as university students, other youth and workers took to the streets on October 23rd, 1956 to demonstrate their solidarity with protesters in Poland and to demand both improvements in living standards, but also democratic political change in Hungary. 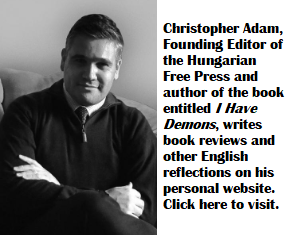 András Göllner was another witness of the 1956 revolution, although he was only 11 years old at the time. Professor Göllner commended the organizers of the Ottawa Hungarian Forum and stressed the importance of pluralism in a liberal democratic society and the value of fostering vibrant discussions, including within Hungarian Canadian communities. Professor Göllner noted that this local grassroots initiative in Ottawa was an example of freedom of speech and pluralism in action. Lighting candles. Left to right: Éva Kertész, Áron Gábor, Rózsa Tóth, Bálint Mészáros and Judit Petényi. Photo: C. Adam. 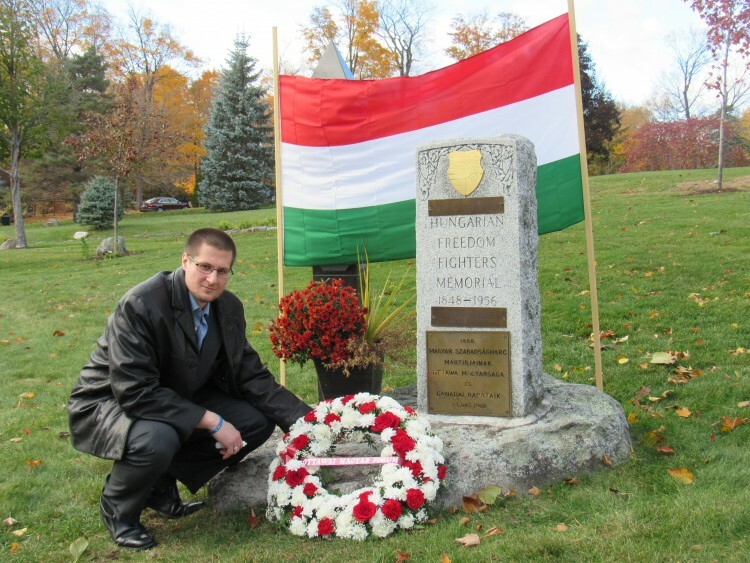 The Ottawa Hungarian Forum’s 1956 commemoration. Photo: C. Adam. Éva and Gábor. Photo: C. Adam. 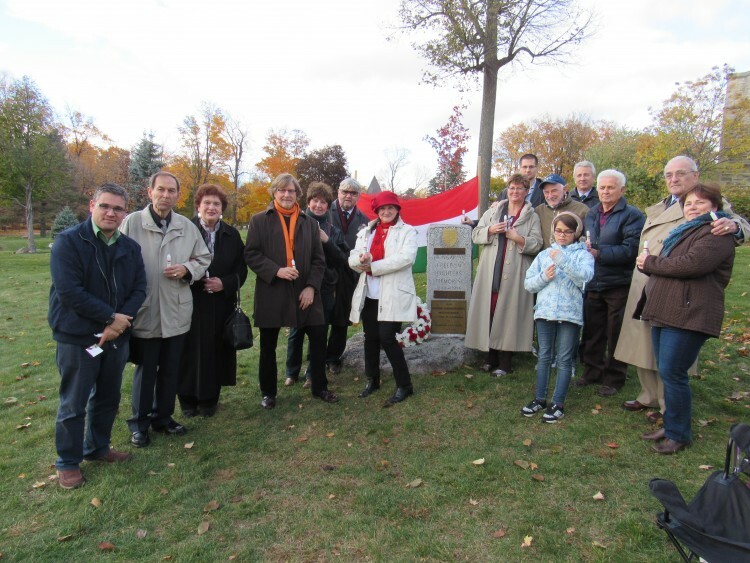 The Ottawa Hungarian Forum’s 1956 commemoration. Photo: L. Jutasi. 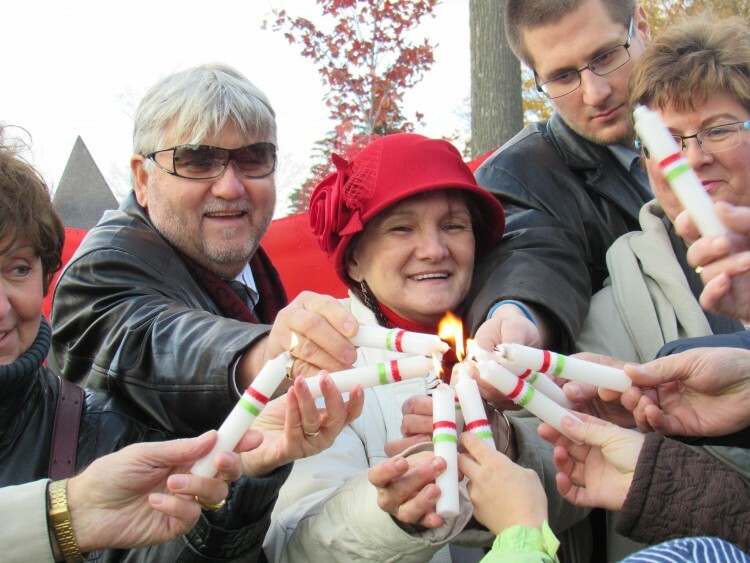 The Ottawa Hungarian Forum’s first public event was undoubtedly modest, yet also meaningful to all those present. The commemoration was also an opportunity to remember Hungary’s first democratic President, Árpád Göncz, who participated in the 1956 Revolution, was imprisoned and who died earlier this month. The fledgling Ottawa Hungarian Forum (OHF or OMF?). Let’s hope it represents a truly representative cross-section of the Hungarian diaspora – free of any undue influence from Orban, Fidesz and Jobbik. Do you have a charter? I’m amazed about the poem ‘Bards of Wales’! I heard it recited by a Hungarian who attended my dinner party in Hungary. He recited it, amazingly off by heart! In English! Did I read somewhere that it was read out in the ’56 uprising as an allegory? A sort of ‘underground’ message? Anyway the recital in English at the dinner party left me gobsmacked! And made me realise how little I knew about my own history. You are absolutely correct that the Bards of Wales was once read out as an underground message of sorts…a coded message that all would and could understand, yet it managed to fly under the radar of the authorities. We are working on formalizing the Ottawa Hungarian Forum and we hope that this will bring about a new air of openness within the community and with some luck, perhaps even serve as a model elsewhere in the diaspora. Great to see it and hopefully it will spread over to Toronto, as well somehow. Always “nice” to see antihunitists “dressed” in the hungarian tricolor. In English, we write Hungarian with a capital “H.” And by the way, the term “antihunitist” is incomprehensible. anti-Hunitic (like anti-Semitic) is it better? I think you understood anyway. Any remembrance of the Hungarian revolt without the mention of the contributions made by canadians fans of Elvis Presley watching the Ed Sullivan show on January 6, 1957 is not complete. Elvis Presley’s appeal for urgent assistance to be provided to the refugees affected by the Soviet invasion of their country in late 1956, made, on his behalf, by Ed Sullivan with the still 21 year old Presley out of camera view and about a minute before the start of this clip, was delivered at 9.55 pm of January 6, 1957 and in front of a television audience estimated by Trendex, the precursor of Nielsen, at 50 million viewers, a percentage of which, albeit small, coming from Canadian television viewers. It translated, in less than a week, in funds being sent by his fans and ostensibly their parents, to the International Red Cross in Geneva, eventually in the amount of US$6million ( the equivalent after adjustments to inflation of some US$49.5 million in 2015 dollars). The funds, which were received throughout the 1957 year were then duly exchanged in Swiss Francs (at the rate of 4.31, totalling SFR26 million) for their immediate distribution and with the help of a single transport plane from US Army, in both persishable items like Army rations, as well as non perishables, to the estimated 200,000 hungarians who as a result settled in Vienna and London, for life. Incredibly, because the news media was very anti-Presley, not a single acknowledgement was made thoughout 1957 and beyond, so it therefore took another 55 years for the world to realize not just the extent of the assistance (major, there’s no other word to describe it) but its actual provenance. In 2102, the Mayor of Budapest, as a gesture of belated, albeit welcome gratitude named a park facing the oldest bridge which unites the old sectors of Buda and Pest, the beautiful Margret Bridge, after Presley, and made him, posthumously, a citizen of Budapest. Guillermo is correct. Elvis Presley name is always worth a serious mention in remembrance of this history regarding the the Hungarian Revolution. Many other writers about that history usually do a fair job of keeping Elvis name front and center when discussing the millions of dollars worth of contributions that went as Aid to help the Hungarian relief … and those funds came directly as a result from Elvis Presley’s request to Americans “to help” while he was on The Ed Sullivan Show … as Guillermo has mentioned. Budapest has even honoured Elvis for his help by naming a park in his honor in their city. I would suggest to the writer if you were unaware of this history this is to be forgiven, but please research it a bit to become more familiar with it and make note of that history for future writings.